Result - Module position (main menu) get changed. I tried to make a copy of my joomla site to another folder and decided to work with new template in the new folder . So there are two folders - one original and another copy. Now I started working with copy folder,and change the default template as new one and updated module positions accordingly...but when I opened the joomla site with the old version , all the changes that I made in new folder is here! I went to back-end for the older version and see that the new template is default set for old site also..why this is happening. As I expect it to be set with the old template and the new folder only with new template. Please help, I know I must be making some blunder here but unable to understand. Is this because both are pointing to same DB? Old template - Breeze3 New template - Corsa This is just done for learning purpose. 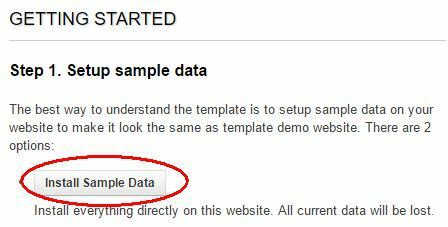 But stuck with the situation that I am not able to maintain separate copy of same site with different template. I just installed the free version of the JSN Corsa template on a test site, and as you say, the template is automatically set as default after installation. This is not good practice in my opinion. I could not replicate the problem with the main menu getting changed, but if you also used the Install sample data button, all your original settings will be overwritten, including your menu settings. As you discovered yourself, if you duplicate the files from your Joomla installation, both folders will use the same database, and any change you make in one instance of Joomla will also affect the other. More substantial changes (like installing extensions) will probably give you error messages when files and database information don't match. The solution is to duplicate your files and your database, thus creating two completely separate Joomla installations. Check the position of the menu for New template whether it is correctly named or the position you are using for new template is given the new template one or the old template. I could resolve this issue by creating new database for the copy of my joomla site. And then changing configuration.php to point out the new database. And now I see changes separate for both the folders. Have you changed the LOGS and TMP path according to the folders. I guess that's the issue. Change the path from admin and then check. I don't think you will find the issues that both of them are working same. Also try creating different Database for both the folders, as the CMS completely works and depends on the database. So any change on one site would reflect other as well. Not the answer you're looking for? Browse other questions tagged module templates or ask your own question.